Supplied in metal packs. 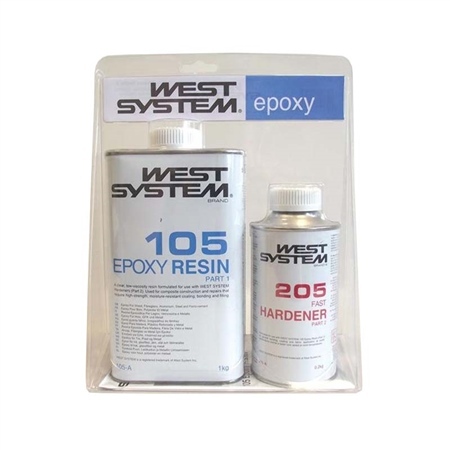 - Epoxy ‘A’ Pack: 1kg 105 Epoxy Resin & 0.2kg 205 Hardener. Suitable for use on wood, GRP, metal, cloth, building. Epoxy and resin supplied in correct mixing proportions in convenient pack sizes. Epoxy resin and hardener developed originally for, and still very widely used in, the boat building industry for all types of bonding from simple gluing of battens to fully laminating wooden yacht hulls. The West System now finds favour in many woodworking workshops throughout the world. Used for any application which calls for an extra strong water resistant joint, i.e. in boat-building or structural work. West System is quality assurance registered to BS5750/Pt2, IS09002 and AQAP4 Edition 2. Approved by Lloyds Register of Shipping. A high strength, easy to use, epoxy system. Originally bought to be used in the building of a traction engine. Since then have found many other uses. Wonderful product.